No self-respecting advertising firm would agree to a product name like the 92 pen and 91 pencil! *Yawn* Yet that's what Waterman's called them. The riveted ball clip is key to identifying these mid-to-late 1930s marble pencils. They are nose-drive operated, using 1.1mm lead, 5 inches long, and have an eraser inside, plus room for extra leads. They have a simple band, no grip on the nose, and jewel-less flat tops. Here is a 91 with the 92 pen. With thanks to Peyton Street Pens for this image. 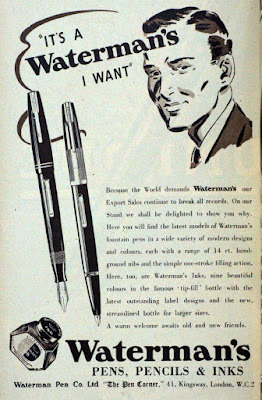 About this time, before WWII broke out, Waterman's began making pens in England, taking over the Falcon Pen Works in Neasden, in NW London. 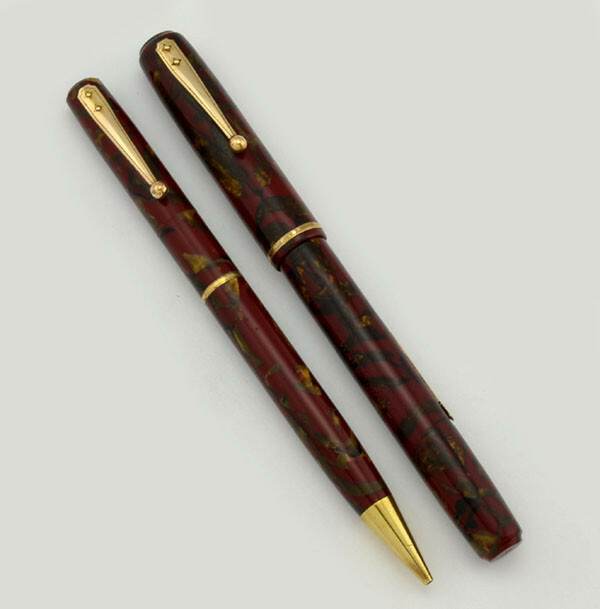 There they made the Pittman Shorthand Pen and a pen called "Unique." In 1946, after the war, Waterman's moved to Finsbury Park, North London (yes, the same place a deranged van driver ran headlong into pedestrians in June, 2017). There, as Waterman Pen Company, Ltd., they made virtually the same products the company was making in the USA, like the Commando. Here is a green striated Commando from across the pond. It has a lovely decorated band, and a bit different clip. The clip is attached in a totally different way, with a little cut-out for the edge of the clip to rest in, and a taller washer. It is a nose-drive pencil using 1.1mm lead. At 4.25 inches, it is smaller than my gold striated lady's Commando by 1/4 inch. American Commandos with their British cousin. It has an eraser inside, arranged in the same way as the Waterman 91 pencil. The imprint says "Waterman's, Made in England." The small A s are in italics, like this Waterman's ad, which was printed in London in 1949. It does include the word pencils, I noticed. Thanks to Anonymous for this image. The matching pen was the Waterman W5 made in England. 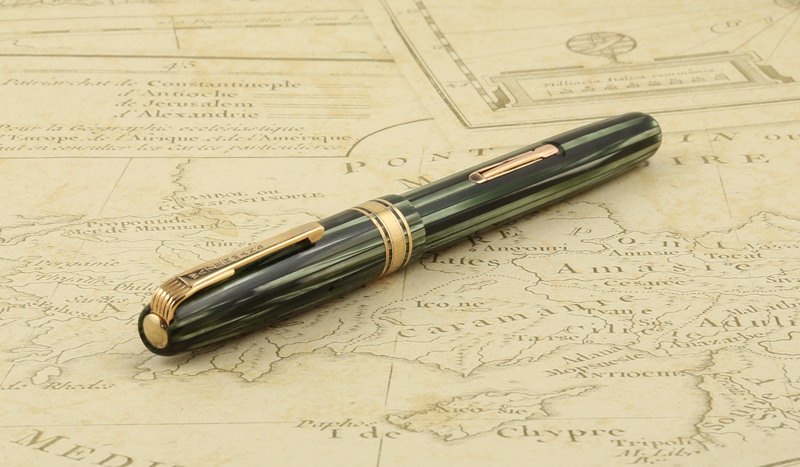 It is said that the English Waterman's continued to make pens into the 1970s. But couldn't they have named them a little more creatively? W5 sounds like a postal code. Right up there with 92/91! Tut, tut. Eventually sons and daughters have the bittersweet, seemingly never-ending task of clearing out their parents' home of posessions those good folks will never need again, for one reason or another. It's nothing you really want to do, but someone has to do it! In the family desk, in one of my dad's innumerable pencil cases, I was pleased to find two Sheaffer Pearlies from dad's college job with Anderson Erikson Dairy in Des Moines. A little Christmas gift from the company, maybe? Unlike all the other family Pearlies, these have the "Fineline" inscription on the clip. Compared to Dad's College Pearlie, the AE advertising pencils have less grip at the bottom. Dad's college pencil also has the duel-layer tip, said (in Sheaffer ads) to prevent lead breakage, and also found on the Sheaffer Triumph "Crest" with the gold-filled cap. There was also a black Pearlie with the duel-layer tip. That's quite a few Pearlies, with several clip, tip, and grip configurations. One other Sheaffer I found was Dad's fountain pen I remembered from my childhood. It turned out to be a Snorkel "Admiral." It has a lovely 14 k nib. Still working, too.